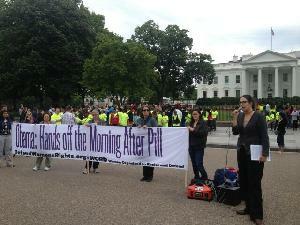 Reports from countrywide actions May 14 -- Obama: Hands off the Morning-After Pill! May 14 marked the first day of a nationwide Week of Action organized by WORD, National Women's Liberation and others to demand access to emergency contraception without restrictions or ID requirements and at an affordable cost. There is no scientific or medical reason to restrict women's access to the Morning-After Pill. Last month, a federal judge ruled that emergency contraception must be made available to all women over the counter, "without a prescription and without point-of-sale or age restrictions." Instead of complying with that ruling, the Obama administration is appealing the decision. 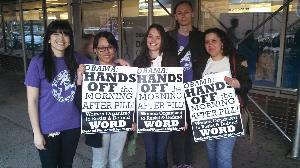 Organizers with WORD, NWL and other women's rights groups took action to say, "Obama: Hands off the Morning-After Pill!" In San Francisco, Los Angeles, Sacramento, New Haven, Washington, DC, New York City, Asheville, Albuquerque, Chicago and other cities across the United States, women took action to demand emergency contraception without restrictions. This week of action continues with actions on Friday, May 17 in Albuquerque, Gainesville and Syracuse; and on Sunday, May 19 in San Diego. 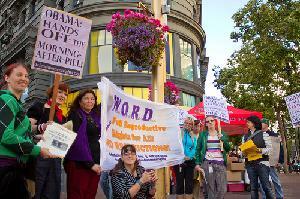 As part of the week of action to say “Obama: Hands off the Morning-After Pill,” a group of women and men with WORD in San Francisco carried out a direct action in Walgreens at Market and 4th St. to put the Morning-After Pill on the shelves—where it should be! From different parts of the store, we congregated at Aisle 3, where the other contraceptives are shelved, chanting “Put Plan B on the shelves, or we will do it by ourselves!” A few people put Morning-After Pill boxes on the shelves as we chanted. WORD organizer Evelyn Martinez read a statement informing the customers and workers why we were there protesting. As she concluded the statement, we marched out of the store with many customers looking on. The group marched down the street to Powell and Market to hold a speak-out and leaflet outside at the BART, bus and trolley stations. Other organizers joined us to help get the word out. Many people walking by stopped to listen, sign the petition and get more information. WORD organizers marched to Walgreens in downtown Los Angeles to demand the Morning-After Pill be put on the shelves. WORD organizer Gisela Santiago delivered a speech demanding emergency contraception be available over-the-counter, and that identification and age restrictions be lifted. Her speech focused on the fact that "age and ID restrictions are racist, sexist and unnecessary!" Following her speech, WORD organizers proceeded to take matters into their own hands and put boxes of emergency contraception on the shelves of the family planning aisle. Amber Tracy, a WORD organizer, explained why she came out to today's action to defend women's rights: "Women should have the right to emergency contraception when they need it and not be shamed or restricted in any way!" she said. She went on to say, "The restrictions specifically leave out undocumented women who make up a large part of Los Angeles." Members from WORD in Sacramento participated in a national week of action at two local pharmacies. At the first pharmacy, a WORD member walked up to the counter at a local pharmacy, asked for the Morning-After Pill, and refused to show ID. The pharmacist insisted she show ID, and said it was the law because of age restrictions and parental consent. She was denied access to the Morning-After Pill because she didn't show an ID and left the pharmacy. At another pharmacy, WORD members placed a small sign stating "Plan B Should Be HERE," and left it on the shelf next to boxes of condoms to let the store and customers know women should have access to the Morning-After Pill like any other contraception method. New Haven activists joined many others across the country in a solidarity action to demand the placement of emergency contraception on pharmacy shelves without restrictions. The action was conducted as a small flashmob, with activists spread throughout a local pharmacy who then came together in the family planning aisle, chanting. An organizer with WORD delivered a short speech decrying the Obama administration's decision to demand government-issued ID with the purchase of emergency contraception. “Do you have to show ID to buy Tylenol?” she asked the group. “Do men have to show ID and prove that they're over 15 years old when they want to buy condoms? No. This is a sexist position. No woman should have to show ID to decide what to do with her own body.” Activists then put mock Morning-After Pill boxes on the shelves and filed out, chanting. 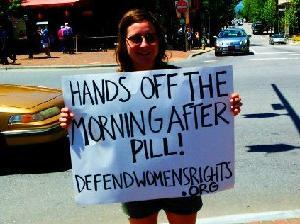 More actions around the Morning-After Pill are to be expected in New Haven this week. In Washington, D.C., WORD activists and volunteers gathered at the White House to demand that the Obama administration stop restricting access to the Morning-After Pill. Activists held a 16-foot-long banner directly in front of the White House that read, "Obama: Hands Off the Morning-After Pill!" The banner attracted groups of tourists, students of all ages, and D.C.-area residents who happened to be passing by. Dozens of people took photos of themselves with the banner to show support. One rally attendee explained why she stood against the age and sale restrictions: "If a man of any age can get a condom without showing an ID, why are women treated differently? Emergency contraception should be accessible and affordable." Heather Benno of WORD encouraged passers-by to get involved: "We won't stay silent for one more day or one more minute while the Obama administration plays politics with our bodies and our lives. Just like the Bush administration, the Obama White House has betrayed women and girls, denying access to safe and effective emergency contraception." WORD collected petitions demanding unrestricted access to the Morning-After Pill, and encouraged people to sign the petition and participate in the online letter-writing campaign. Over 30 women and their allies participate in a flashmob at a Duane Reade store in New York City in response to the Obama administration’s attempt to impose restrictions on women’s and girl’s access to the Morning-After Pill. Shortly after, participants, who were spread throughout the store, began to chant: “What do we want? Morning-After Pill! Where do we want it? 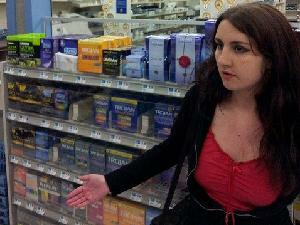 Over-the-counter!” and gathered in the family planning aisle. A group of WORD organizers, women and male allies went into the streets with signs and petitions for several hours. The action received a lot of support from locals in the area, and one woman passing by actually parked her car and came to stand with the group for two hours holding signs. Organizers also distributed fliers and gave information to those who wanted to know more about the issue, and many people signed the petition in support. In Chicago, Illinois, activists dropped banners over busy highway overpasses on both May 7 and May 14. In Albuquerque, New Mexico, activists did outreach in preparation for their event on May 17.